Though set after World War II, the lessons learned from the holiday classic "White Christmas" have just as much meaning today as they did then. 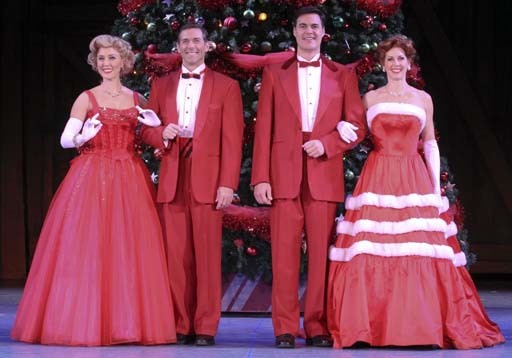 WASHINGTON – The first indication that Irving Berlin’s “White Christmas” at the Kennedy Center had something to teach its audience came before the orchestra had even played the first note of the overture. A friendly voice came over the loudspeaker in the Opera House, reminding those in attendance that the musical takes place in a time before cellphones and watch alarms and inviting them to silence their own devices in that spirit. “White Christmas” was originally a movie released in 1954 co-starring Bing Crosby and Rosemary Clooney, the original pair who sang the title song as a duet. It was adapted into a musical in 2004 and has since been on a worldwide tour through Canada, the United Kingdom and Australia. The musical begins with soldiers goofing off and singing on Christmas Eve in 1944 during World War II. Though the original movie was, in all likelihood, not intentionally written to connect future Christmases to the ones it portrays, the parallel between then and now that presents itself in the modern musical is striking. War themes that many struggle with in America today are woven into the musical. General Thomas Waverly, shown in the beginning, comes back into the picture 10 years later as the musical shifts into 1954 after the first scene. The general is the head of a small Vermont inn, a destination that the show’s main characters travel to after a bit of scheming and trickery. All has not been well for Waverly after the war, as it has been hard for him to transition back to normal life. The stiff former general in “White Christmas” craves the structure of the Army, and many pieces of Army culture filter into everyday life at the Vermont inn, even as the business struggles and the bills form an ever-growing pile. But while Waverly considers going back into active-duty service to resolve his inner turmoil, his family, friends and even former battalion members show their love and support. Lesson two: Support loved ones when times are hard. Concern for Waverly is present throughout the entire musical, adding depth to the easygoing, carefree nature of the romances that develop and the show tunes performed. Even the general’s grandchild in the musical is worried about his happiness, as shown by her prayer for him toward the end of the first act. Lesson three: Let children affected by the grown-up world feel needed. On its surface, the musical is a show about a show, derived from a film about a show. It provides a window into the magic of making a musical, even as the audience’s suspension of disbelief kicks in — kind of like a window into the magic of Christmas. Lesson four: Americana-style Christmas is one part spectacle, one part meaningful interaction. There’s the playful version of a Scrooge theme, where one man on the train to Vermont has been tricked into heading north for Christmas, instead of traveling to sunny Florida. The passengers around him sing about how excited they are to see snow while the man sits stubbornly in the center, not participating and looking decidedly grumpy that things did not go his way. Of course, he is the same character who shows the most growth in the musical, falling in love and revealing his true, good-natured colors. Lesson five: Wonderful adventures can be had when people let loose and have fun.